My association with Athabasca University began in 1999 when I wrote a course in ethnobiology (ANTH 491) for distance delivery at AU. I assumed a teaching position in the Anthropology Program in spring of 2000. My undergraduate degree in Anthropology was earned at Stanford University in 1971. I completed my graduate studies in Anthropology at the University of Alberta (M.A. 1993; Ph.D. 1997). After finishing my Ph.D. 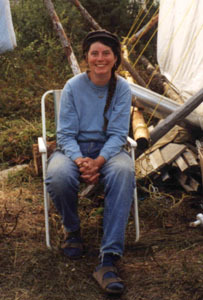 I was Grant Notley post-doctoral fellow in the Anthropology Department at the University of Alberta from 1997-2000. While at the University of Alberta I initiated a research project on ethnoecology of First Nations in northwestern Canada. Before returning to graduate school in 1991 I lived in northwestern British Columbia where I developed close ties to local First Nations communities. (I also developed an appreciation of the challenges of access to universities and good libraries while living in remote areas). I am fascinated by the kinds of things people know and the connections among these forms of knowledge. I am especially interested in knowledge of the land and how people “fine-tune” their ability to live in local environments. My research interests include ethnobiology (cultural knowledge of living things), ethnoecology, subsistence, and concepts of health and healing among northwestern Canadian First Nations, and material aculture and traditional technologies of northwestern Canadian First Nations. I began my field-work with the Gitksan and Wet'suwet'en of northwestern British Columbia in the mid 1980's. In more recent years I expanded my research to work with the Kaska Dena of the southern Yukon, the Gwich'in of the Mackenzie Delta region of the Northwest Territories and the Sahtu people of Deline on Great Bear Lake. I'm an active member of several professional societies and serve on the editorial board of the journal Ethnobiology and Ethnomedicine. I also actively teach in the Master of Arts—Integrated Studies (MA—IS) program. More information about my graduate teaching may be found on my Landing profile and my page on the MA—IS site. Recent publications include various papers on ethnoecology and ethnobiology of First Nations in northernwestern Canada, a chapter on past evidence of plant use in the Chac Mool proceedings (2009), and two books on landscape ethnoecology in 2010. I also have a chapter on researching cultural knowledge of landscape in a 2011 textbook of Ethnobiology, edited by EN Anderson et al., with Iain Davidson-Hunt of the University of Manitoba, and a chapter on Language in Landscape edited by David Mark, Andrew Turk, David Stea and Niclas Burenhult (2011). 2013 contributions include a paper on Northwest Coast Burden Straps in the journal Museum Anthropology, and a discussion of landscape knowledge in the Fall 2013 ethnobotany theme issue of BC Studies (see pdf linked to my Landing site). Anthropology tutor Janelle Baker and I authored a paper on teaching ethnobiology at a distance for a textbook on Innovative Strategies for Teaching in the Plant Sciences edited by our colleague Cassandra Quave which was published in 2014. Personal interests include playing Celtic and Early music and British Isles folkmusic; Renaissance and Circle dancing; spinning, dyeing and weaving; watercolour painting; and gardening. In more recent years I expanded my research to work with the Kaska Dena of the southern Yukon, the Gwich'in of the Mackenzie Delta region of the Northwest Territories and the Sahtu people of Deline on Great Bear Lake. Most recently, I have been involved in collaborative visioning around northern community well-being, and in 2015 co-organized a major conference Wisdom-Engaged: Traditional Knowledge for Northern Community Well-Being URL for which the University received a SSHRC Connection Grant.